Breakfast before school is usually a granola bar on the way out the door, or a half eaten bowl of cereal. 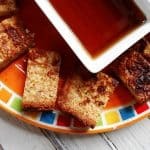 However, when my kids know that there are French toast sticks in the freezer, they are more than happy to make time to sit down and eat. A hot breakfast is a great way to start the day, whether it be you or your kids! My kids are growing up fast. My youngest is 13, entering eighth grade this year, my 15 year old son will be a sophomore in high school and my 18 year old daughter starts her first semester of college in a few weeks! My oldest son is 20 and pursuing a career with his dad. I can’t believe it. Teenagers have a bad habit of leaving in the morning without eating anything. So if I am able to do something to prevent that, whether it be to have some homemade granola they can take with them or to stock the freezer with frozen pancake dippers and French toast, I’m going to do it. I’ve even taught them all how to quickly make a portable scrambled egg, we call them muggies. It drives me batty if they leave without eating! 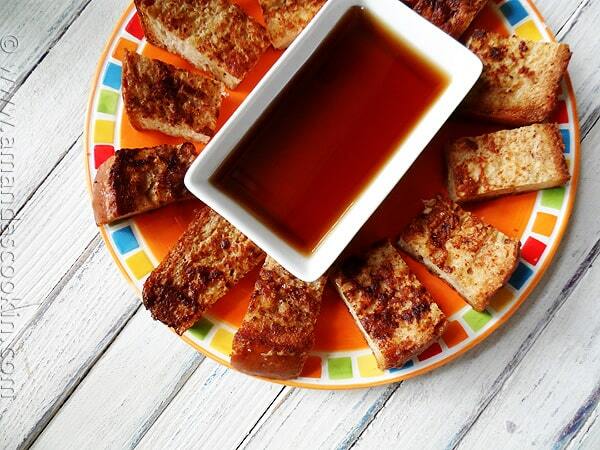 My kids really love French toast, so when I stock the freezer with them I know they’ll eat breakfast. I’ve recently started baking extra loaves of this homemade white bread, which works beautifully for French toast. Freezing them is easy too. 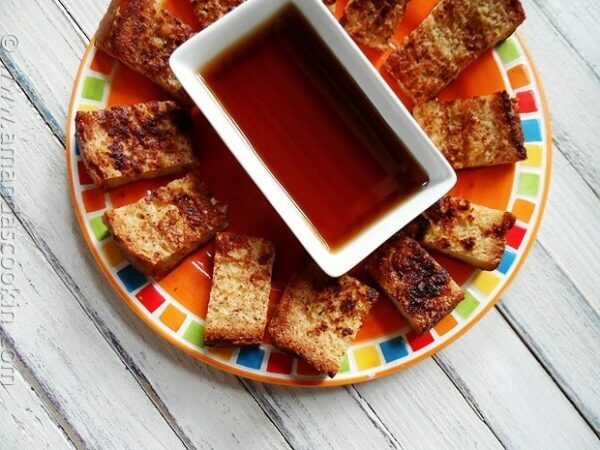 Just make your favorite French toast recipe, or use mine (printable version below) and allow the slices to cool on cooling racks until they reach room temperature. You definitely want to use cooling racks so that the air can pass through the grates, otherwise your toast can become soggy. Line a baking sheet with waxed paper. Once the toast slices are cooled, use a sharp knife to cut them into bite sized pieces. Depending on how many you’ve made, you can either lay the pieces flat on the sheet or stand them up if you have a lot as you’ll get more on the sheet that way. Make sure that they aren’t touching each other if possible, otherwise they may stick together. Place the cookie sheet in the freezer (if you don’t have a large freezer, use plates or whatever else will fit) and allow the bite sized pieces to freeze completely, 5-6 hours or overnight. Take the frozen bites out of the freezer and put them into zipper freezer bags. By freezing them individually first, they will not clump together in the freezer bag and you’ll be able to easily remove as many or as little as you like. Alternatively, you can make individual servings by using zipper sandwich bags instead. These are great for controlling portion sizes, cutting down on waste (for those with eyes bigger than their bellies) and for adults to take to work with them (thanks to Angela from Big Bears Wife for that suggestion!). Place your frozen sticks on a microwave safe plate and heat at 100% power for 1 minute. Check for doneness, heat for additional 15 second intervals if needed. In a medium bowl, whisk together the eggs, milk, 2 tablespoons of sugar, and cinnamon. Melt 1/2 tablespoon of butter in a large skillet over medium heat. Dip bread into the egg mixture to coat both sides. Place in skillet, cook until golden, about 4 minutes, then flip and cook the other side 4 minutes. Repeat with remaining slices of bread. Melt 1/2 tablespoon of butter in the skillet before frying each batch. Allow the slices to cool on cooling racks until they reach room temperature. You definitely want to use cooling racks so that the air can pass through the grates, otherwise your toast can become soggy. Line a baking sheet with waxed paper. 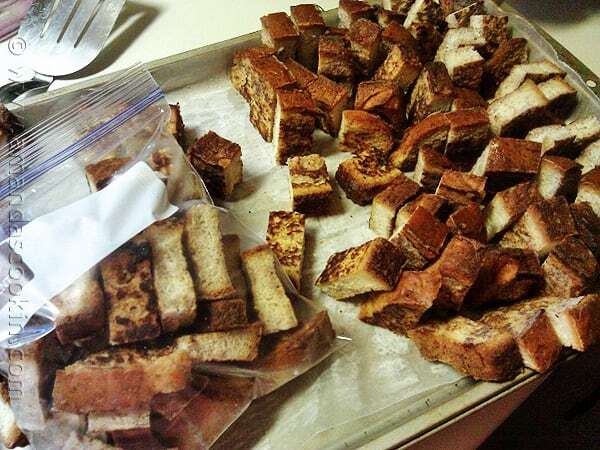 Once the toast slices are cooled, use a sharp knife to cut them into bite sized pieces. Depending on how many you've made, you can either lay the pieces flat on the sheet or stand them up if you have a lot as you'll get more on the sheet that way. Make sure that they aren't touching each other if possible, otherwise they may stick together. Place the cookie sheet in the freezer (if you don't have a large freezer, use plates or whatever else will fit) and allow the bite sized pieces to freeze completely, 5-6 hours or overnight. Take the frozen bites out of the freezer and put them into zipper freezer bags. By freezing them individually first, they will not clump together in the freezer bag and you'll be able to easily remove as many or as little as you like. Alternatively, you can make individual servings by using zipper sandwich bags instead. Place in a single layer on a microwave safe plate and heat at 100% power for 1 minute. Check for doneness, heat for additional 15 second intervals if needed. Wonderful breakfast recipe. My nephews just love it. Well, I do too! I love this idea. I would be a fast wonderful breakfast. THESE look SUPER DUPER delish. What a great idea! I’ve got to get some of these made before school starts for our kids. what a great idea, love how easy this is! this is perfect. i love french toast! great tip since back to school is about to start. My kids are 5 & 10, and I think they would completely like to have this breakfast option once in awhile – thanks! LOVE this idea…Question…Can I reheat the frozen sticks in a regular oven? I am unfortunately “microwave-less”! 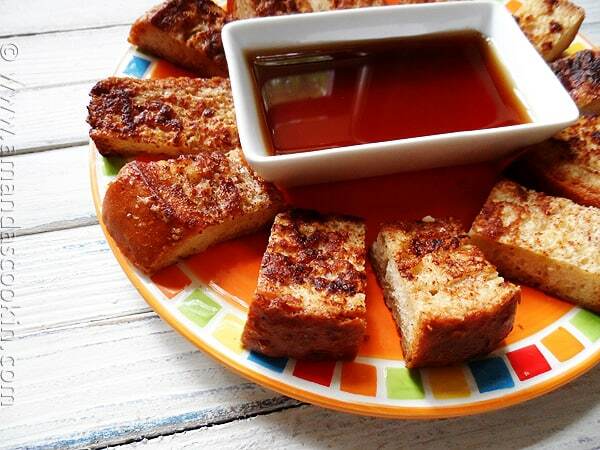 !..Thanks for the great post..I simply adore French Toast in all variants!! I am sure you could. I haven’t done it, but I would imagine the temperature and time would be similar to heating the ones you buy at the store in the freezer section. I don’t have any hear to refer to, but I’m going to guess 375 or 400 F maybe? 7-10 minutes? If you do it I would love to know what temp and time works for you! I reheat these in my toaster oven at 400 degrees for 5-6 minutes, or on the toast setting if I’m really in a hurry. They get nice & crispy again. Anytime I can avoid a microwave to reheat food, I do. Toaster oven saves from having to heat whole oven up. Also, one other note, I really let the bread soak up as much egg as possible, brown on the skillet and finish off in the oven to ensure all egg gets cooked. This brings the protein content up to beyond “minimal” and lessens my guilt for loading them up on carbs to start a long day! I do this all the time :) Also works great with pancakes!! I am totally making some of these this weekend! !